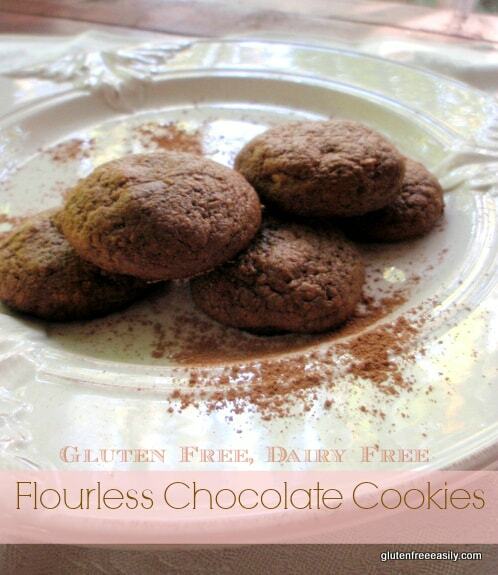 Flourless Chocolate Cookies Easily Deliver on Chocolate Flavor! Almost all of us love chocolate chip cookies and the inclusion of chocolate chips can turn a so-so recipe into a winner for sure, but I’ll confess something. I don’t always like having to keep chocolate chips on hand. They add to the grocery bill, are one more thing to remember to purchase, and they often get eaten alone—sans recipe—when I’m having a chocolate craving. Anyone else do that? Plus, even with “healthier,” “allergen-free” chocolate chips, I don’t always feel great after I eat them. So I decided to look for another solution for today’s Flourless Chocolate Cookies recipe to get my chocolate fix. How could I make chocolate cookies without chocolate chips and make them easily? The solution was quite simple really. I just added some cocoa powder to my standby Flourless Peanut Butter Cookie (or Nut/Seed Butter Cookie) recipe to create Flourless Chocolate Cookies. Either raw cacao powder or regular old Hershey’s cocoa powder will do the trick. All it took was one tablespoon to add just the right amount of chocolate flavor when I made the recipe using almond butter. The next time I made them at home, I was making them with peanut butter but was a wee bit short—about ¼ cup—so I used ¼ cup packed almond flour to make up the difference. The resulting cookie was softer in the middle, a bit puffy if you will (I like Puffy Cookies), and was slightly less sweet but was honestly even more delicious. And very photogenic, too, I think! Honestly, I’ll be making this chocolate-fied recipe much more often now to get my chocolate fix. And I won’t have to be sure if I have chocolate chips in my pantry. I love that! Did I mention that these cookies are naturally dairy free, too? Take a look at the recipe. These cookies will work for so many special diets, all the while giving you delicious chocolate cookies that truly lack for nothing! These Flourless Chocolate Cookies are made using cocoa instead of chocolate chips but they still provide rich chocolate flavor! Even if you're a lover of cookies made with chocolate chips, you'll love this recipe---especially when your chocolate chips have "disappeared"! Preheat oven to 350F degrees. In a large bowl, mix all ingredients together well. Makes about 16 to 18 cookies. The color/darkness of the cookies will vary according to whether or not nut, seed, or peanut butter is used, and if almond flour is added. If using natural peanut butter, sometimes it's best to press down a bit before baking—with a fork or the bottom of glass—for them to spread enough. I don't press down when I use almond butter or homemade nut butter though, so you might want to experiment to see which method you prefer. SunButter has a much stronger flavor than nut butter or peanut butter, so you might wish to add a bit more raw cacao powder or cocoa powder. For other variations, you can make “Nutella” Sandwich Cookies by spreading my homemade Double “Nut-ella” on the underside of one cookie and then pressing another cookie on top (method shown here in original version). Or you can make Cookie S’mores---one of my very faves! When you’re feeling really decadent, you might even want to add some chocolate chips to this new recipe for a super chocolate-y effect. IF you have chocolate chips on hand, that is! I must confess I sit down with a bag of chocolate chip way to often, then when I need them I’m out! Me too! I thought I was the only one doing that. What a great idea! I can’t believe I’ve never seen it before since that flourless cookie recipe has been around for so long. I’m sure they’re delicious. Thanks for sharing them at Gluten-Free Wednesdays! Linda–Well, you know how that goes … someone has probably done it, but I thought of the idea and I didn’t go looking to see who else beat me to it. 😉 These cookies are delish for sure. I see lots of variations in my future. As I was saying to Cassidy, I was playing around with another variation today. I keep making them healthier with less coconut sugar in every version. 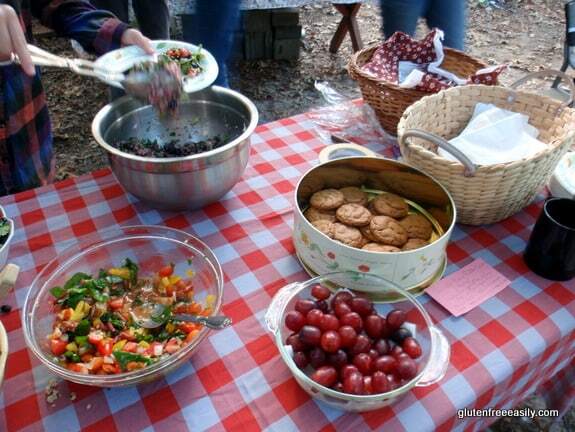 I’m always happy to take part in your wonderful Gluten-Free Wednesdays event. We all count on that each week! Wonderful cookies Shirley! I love this recipe and its simplicity! Great idea. I do get that need for chocolate sometimes and I like that I can make these fast. Shirley these cookies sound fabulous – plus look great too! Great idea to use almond flour as well – yum! YES. In fact, I often eat all the chocolate chips WITH spoonfuls of peanut butter. It’s one of those snacks that seems like it should be so satisfying in a small quantity, but I always end up overeating anyway. Making cookies is usually better because some of the restless “feel like eating chocolate” energy gets sunk into the making of the cookies. I love flourless PB cookies and will have to try this cocoafied version soon. Plain chocolate chips? I SO do that. These look yummy! 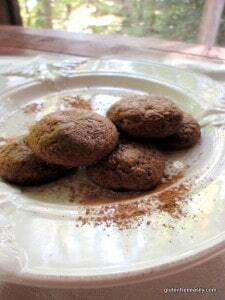 I am so glad to find a chocolate cookie that uses coconut sugar and doesn’t require chocolate chips! I was just told I have to take out all sugar, so I’ve been experimenting with stevia and coconut sugar. Can’t wait to try these. Hi Alexandra–Welcome to gfe! 🙂 I’m so happy to be helping you and others out. Hope you enjoy these when you make them! O. My. Goodness. Made these today with the 1/4 C of almond flour for an after school snack and they were super yummy!!! Thanks again!!! Hi Phoebe–Welcome to gfe and thanks! But there are no chocolate chips … that’s the whole point of the recipe. 😉 Hope you enjoy them! How did I not see this before?! I think it was simply because I desperately need a cookie that I can eat today 🙂 These are on the way to my belly, if I can keep a few from the kids that is! Thanks so much Shirely for altering your yummies when I am around, your the best! I made these tonight for my family and they didn’t turn out like the picture. They puffed up while baking but went completely flat upon cooling. Did I do something wrong? Hi Melissa–First, welcome to gfe. 🙂 Second, I’m sorry your cookies didn’t turn out like mine. Which nut or seed butter did you use? Did you make any substitutions? I hope they still tasted good. Thank you for getting back to me! I did make a few substitutions but didn’t think it would matter…..guess it did! GF baking is tricky, but I am not giving up! I used homemade sunbutter and 1/4 cup of organic cane sugar because I didn’t have the coconut sugar. Is it healthy for you? Also, because I only had 1/2 cup of sunbutter, I halved the recipe. I ended up using a small egg vs. a large egg. Would that have mattered? My family loved them that just didn’t look great but I would like them to look like yours so I can use them for a Christmas cookie! Thanks again and I look forward to your reply!! Can I sub egg replacer or applesauce for the egg and you think tahini might be ok? These are ABSOLUTELY DELICIOUS!! I used the 1/4 cup almond meal with 3/4 cup sunbutter and just over a 1/4 cup coconut sugar (I don’t like things too sweet). The texture alone is amazing – so satisfying – and the taste is awesome. What a brilliantly easy little recipe. Congrats Shirley! And thank you!! Hi Giovanna–First, welcome to gfe! Second, thank you so very much for your sweet feedback, sharing exactly how you made your version! Waking up to your comment was delightful! 🙂 I have a bunch of flourless cookie recipes here on gfe and they’re all easy to adapt as needed. Gotta love that! 😉 Thanks again, Giovanna. I had to share your review on my gfe Facebook page. I hope it will inspire some other readers to give them a try!